What do these check lights mean? These check lights are on in an e30. Just wondering what they mean before I buy a car. FS:6 x 0280150715 Bosch injectors. Car has done 112,000 KM's Not sure if they have been replaced before or not but were running fine in my m20b25 $50 pick up Wellington or can post at buyers expense. Mtech 1 steering wheel. Fine spline, bigger diameter version. Leather has some wear period correct patina. Stitching has separated above right spoke but the rest is fine. Overall in decent condition I would say. Look down upon other base model E28/E30 drivers with their peasant spec steering devices while you cruise along with your hands comforted by this ergonomically pleasant, motorsport inspired steering wheel. All for the measly sum of $100. A mere bargain, really. Pickup from Panmure. E30 24 valve swap guys, what'd you do to CCV? While I'm patiently waiting on parts to arrive from Pelican Parts I thought I'd tidy up my M52B28 some more before putting it in my E30. I would like to delete as much extra componentry as possible. I have already removed PS pump and AC pump etc. What'd you guys do to the things like purge valve & CCV? Also, any handy tips for stripping down an auto loom to manual? I'm basically left with 4 wires right now that go from trans dme to eng dme that I need to figure out what they're for (tomorrow's job). Thanks in advance for any help! This forum has prevented many headaches! 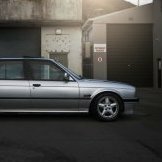 what to look out for when buying an e30? im new to the bmw scene so any help would be appreciated. what engine size would be the best in terms of reliability? where are the usual rust spots etc? what are common problems? WtB a set of 16" style 5 16x7.5 ET20. WtB a set of front sport seats for an e30. WtB the sport seats bolster foam insert (drivers door side) for an e28.. maybe someone has a spare passenger seat which this could be sourced from? Can provide a picture if need be. 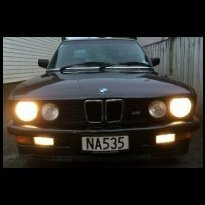 Wanting to purchase a manual e30. Have a 325i E36 that could be looking at swapping or doing a deal with. Based in Wellington. Looking for a e30 preferably in delphin grey with a sunroof keen to see what's out there. As per above, used for a month if that. Surplus to requirements, your aftermarket seat just bolts straight onto it. Can get some sliders from NZKW for extra neatness Near new condition, got a E36 now so is not needed. Looking for $120 ono Pickup in Auckland Thanks! Hi guys, My E30 is having issues... Again. Under specific loading conditions, there's a notable loss of power and an audible sound between 3000-4000rpm. I've tried to capture it in the video but didn't do too well. That and my "camera mount" kept talking. Typically part throttle under acceleration on the flat, or anything from half to full throttle up hill. Sounds like launch control is engaged (IE unburned fuel igniting in the exhaust). It doesn't seem to occur when the engine is cold. Apologies for the video... Couldn't find the right mount to get good footage of the tach so I had to make do with a friend's arm. 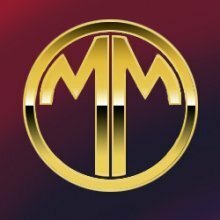 Any help is appreciated! I've a bunch of parts needed for a manual conversion of an E36. Getrag 260 Gearbox Manual pedal box Shifter assembly from E36 325i (getrag 220? possibly ZF, came from a car without a gearbox) Shifter boot flywheel bolts Hard and soft lines Getrag 220 X member and mounts other misc parts (see pics) $600 for the getrag 260, comes with shifter fork and associated shiznit. $200 ONO for various manual conversion bits and bobs. 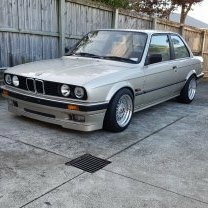 Hey all, Been considering buying an E30 for a few months, and I've decided to do just that. I was going to buy one today, but it got sold 2 hours before I could put an offer in! I'm after a 318i, with under 200,000kms, automatic, and preferably 4 doors. Thanks! I’m wanting to change the springs/shocks on my ’91 E30 325i Convertible. A PO has fitted aftermarket springs that have lowered the car ~45mm (currently 310mm front, 320mm rear – height from centre of wheel to top or arch). It is still on standard Sachs shocks, so needless to say the ride is terrible. I have become very diligent at avoiding minor road imperfections to avoid hitting the bump stops constantly. I don’t want to go back to stock springs and have the massive stock fender gap at the front. It’s my daily driver and won’t see any track use. I don’t mind/like firm suspension, I just want to avoid having an overly jarring ride/hit bump stops regularly. I’m currently thinking about one of two options: Option 1: M Technic spring set (apparently still available according to Pelican Parts) and Bilstein HD (B6) shocks, with 3mm spring seat at front and 5mm at rear. (Lowering height over stock anyone? I read in US forums anything between nothing and 15mm) Option 2: H&R sport springs and Bilstein Sport (B8) shocks, with 9mm spring seat at front and 10mm spring seat at rear (I’m only specifying these as I don’t want to go too low). (H&R springs lowering apparently 1.4” at front .75” at rear) (Both of the above options are with the convertible specific springs to carry extra weight at rear) My question is, does anyone happen to run a similar setup on their E30 and how do they find this on NZ roads (subjective I know), or any other suggested setups? Also if anyone runs either kit, how much did they find it actually lowered the car?